The dog, an 8-year-old boxer, has been quarantined, Topsham police say. TOPSHAM — Police say a 17-month-old Wiscasset girl was airlifted to a hospital following an attack by a dog in Topsham Tuesday evening. The girl sustained serious eye injuries during the attack, according to police, and will likely be sent to a Boston hospital. 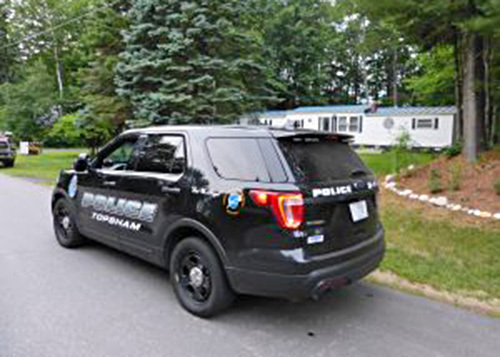 Topsham police respond to the Raymond Road residence Tuesday evening where a 17-month-old girl was attacked by a dog. Topsham Police Sgt. Robert Ramsay said the injuries are not life-threatening. The incident was reported at a residence on Raymond Road at 6:09 p.m. The girl was at a home with the dog’s owners, who often watch the child. The dog, an 8-year-old boxer, was quarantined at Coastal Humane Society, police say, in accordance with state law. There were no previous incidents with the dog and police hadn’t received complaints about the dog, according to Ramsay, and that the animal was up-to-date on its rabies vaccinations. Ramsay said because there is no history of problems with the dog, the incident is considered an accident by the District Attorney’s Office. Ramsay said he believes the dog’s owners will opt to have the animal destroyed.